PYONGYANG, North Korea -- U.S. Secretary of State Mike Pompeo traveled to North Korea on Wednesday to finalize plans for a historic summit between President Donald Trump and the North's leader, Kim Jong Un. 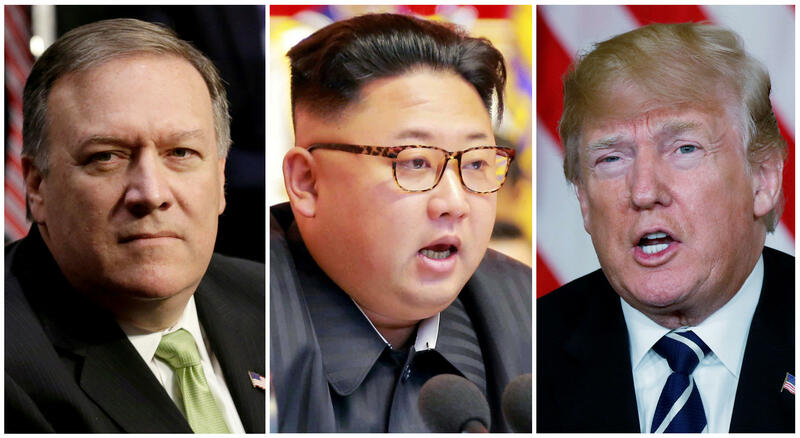 Pompeo is expected to return from North Korea with three Americans who have been detained in the country, sources familiar with the matter told CBS News on Tuesday. Pompeo discussed the agenda for a potential summit in a meeting with Kim Yong Chol, vice chairman of the central committee of North Korea's ruling party. "For decades, we have been adversaries. Now we are hopeful that we can work together to resolve this conflict," Pompeo said, adding that "there are many challenges along the way." Kim noted the improved relations between the Koreas, as well as the North's policy to "concentrate all efforts into economic progress" in the country. "This is not a result of sanctions that have been imposed from outside," he added, citing the will of the Korean people. Mr. Trump has said that his pressure tactics brought North Korea to the negotiating table. The trip, Pompeo's second to North Korea this year, had not been publicly disclosed when he flew out of Washington under cover of darkness late Monday aboard an Air Force 757. Mr. Trump announced the mission Tuesday afternoon as he laid out the case for withdrawing from a landmark nuclear deal with Iran, another bitter U.S. adversary. Minutes later, Pompeo arrived in Japan to refuel before flying on to Pyongyang. Accompanying him were a handful of senior aides, a security detail and two journalists -- one from The Associated Press and one from The Washington Post, both given roughly four hours' notice of his departure. Is Kim Jong Un willing to accept Trump's denuclearization demand? "Plans are being made, relationships are building, hopefully a deal will happen and with the help of China, South Korea and Japan a future of great prosperity and security can be achieved for everyone," Mr. Trump said at the White House as he announced Pompeo's visit. Pompeo's first trip to Pyongyang, over Easter weekend before he was confirmed as secretary of state, was a closely held secret. News of it did not emerge until just before his Senate confirmation vote less than two weeks ago. Shortly afterward, the White House released photographs of Pompeo and Kim. It was not clear whether Kim would meet Pompeo on this trip. "We're prepared to meet with anyone who is speaking on behalf of the North Korean government and can give us solid answers, so we're prepared," Pompeo told reporters on Tuesday. He told reporters aboard his plane that his first visit was to test the North Korean's seriousness of pledges to South Korea on easing tensions. This trip is "to put in place a framework for a successful summit," he said. Although there were no guarantees that the American prisoners would be freed during Pompeo's visit, U.S. officials said their release would be a significant goodwill gesture ahead of the Trump-Kim summit that is expected later this month or in early June. "I think it would be a great gesture if they would agree to do so," Pompeo said, adding that it would be difficult to hold a leaders' summit if the prisoners remained captive. The three Korean-Americans -- Kim Dong Chul, Kim Hak Song and Tony Kim -- are all accused by the North of anti-state activities. Mr. Trump has said that a time and place for the summit have been decided, but has not said where and when it will be. Pompeo was less committal on the flight to Asia, telling reporters, "we think we have it figured out," but adding he was still hoping to get firm commitments from the North on a time and place for the summit. Condoleezza Rice on North Korea summit, Trump and "Political Risk"
Pompeo's visit to Pyongyang aims to lock down the date and venue for a formal announcement to be made. It came just a day after Kim returned from China, his second trip to the neighboring country in six weeks to meet with President Xi Jinping. A Trump-Kim meeting seemed a remote possibility just a few months ago when the two leaders were trading threats and insults over North Korea's development of nuclear weapons and ballistic missile tests. But momentum for diplomacy built this year as North and South Korea have moved to ease tensions, including with their own leaders' summit late last month. In March, Mr. Trump unexpectedly accepted an offer of talks from Kim after the North Korean dictator agreed to suspend nuclear and missile tests and discuss "denuclearization." According to South Korea, Kim says he's willing to give up his nukes if the United States commits to a formal end to the Korean War and pledges not to attack the North. Kim was quoted as saying Monday by China's official news agency Xinhua, "I hope to build mutual trust with the U.S. through dialogue." He added that a political resolution of tensions on the Korean Peninsula and denuclearization should proceed in stages, with all sides moving in concert. Pompeo and officials traveling with him said the Trump administration would not repeat mistakes of the past, which they described as accepting gradual, incremental and long-term disarmament in exchange for immediate benefits. One senior official said Mr. Trump and Pompeo were looking for "a bold approach" that would fundamentally alter the security situation. "We are not going to head back down the path that we headed down before," Pompeo said. "We will not relieve sanctions until such time as we have achieved our objectives. We're not going to do this in small increments where the world is essentially coerced into relieving economic pressure." Mr. Trump has said that withdrawing U.S. forces from South Korea is "not on the table." Some 28,500 U.S. forces are based in the allied nation, a military presence that has been preserved to deter North Korea since the war ended in 1953 without a peace treaty.